While the facade of the Palace of Charles V at the Alhambra in Granada, Spain is in the Renaissance style of architecture, the interior has been mixed with that of the Roman Empire. 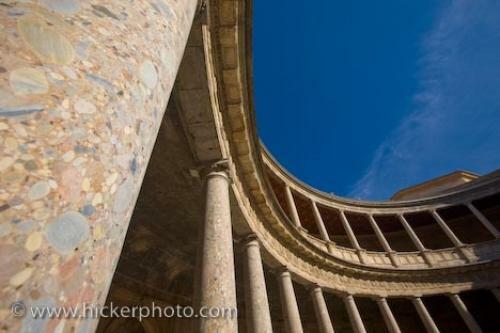 If not for the circular patio, the Palace of Charles V at the Alhambra in Granada would be pure renaissance style of architecture, however the fact that the patio is circular is fashioned more on the Roman Empire style of architecture. Columns in the circular courtyard of the Palace of Charles V (Palacio de Carlos V), The Alhambra (La Alhambra) - designated a UNESCO World Heritage Site, City of Granada, Province of Granada, Andalusia (Andalucia), Spain, Europe. styles of the Palace of Charles V at the Alhambra.